What a busy weekend!!! And a very tired Monday. I am happy the weekend activities went so well though and am determined to have a great day today. Firstly, I am wearing my favorite argyle tights (I love patterned or textured tights, so fun), secondly, I am drinking pumpkin spice coffee, and thirdly, I am looking forward to a date tonight with Adam, thanks to my mom for babysitting and my sister Liz for the Chili's gift card! So this Monday can't be that bad, right? Saturday was our annual Ladies Lunch at church and it was a huge sucess. We have two annual ladies events at our church - the Ladies Tea in the Spring and the Ladies Lunch in the Fall. We had over 70 people there this year, including the 13 little girls that my friend Rachel and I entertained. This was my first time hosting the little girls' table and it was so much fun. I recruited Rachel to help me and I was so glad for her help when I found out how many were coming. We had lots of fun activities and crafts for them. When they arrived I had them cutting out leaves to decorate my "ugly" bare tree (made on poster board and hung on the wall) and they loved taping their leaves to the tree's branches, followed by a bean bag toss game with a big pumpkin Adam made on a cardboard box where he cut the mouth open. They ate lunch and dessert and then decorated these cute little purses with jewels, buttons, and sparkly butterflies, hearts and flowers. We left those to dry and went downstairs to a classroom and Rachel read them them this Max Lucado story about an oak inside an acorn. The girls decorated their own acorns to take home. I was really excited because my both my sister in laws came to the lunch with my nieces. It was very special! The theme for the lunch this year was "Scrapbook Moments" and although we normally do not do a craft for the adults we thought it would be nice this year to have one to go with the theme. I recruited Rachel once again to help me prepare the craft kits for the ladies to make. We included a frame, a fabric background (fabric matted to cardboard with mod podge which we did ahead of time to allow drying time! ), a verse and ribbon to go around the verse. They ladies enjoyed putting them together and here is the funniest story. My husband helped Rachel and I put the kits together (into ziplocks) and he thought it would be fun to put a "golden ticket" inside one of the frames. I did not know this, and when I got home from the lunch he asked who won his golden ticket. I thought he was joking, but apparently not. I told him I didn't know, because no one had said anything. He brought it up at church the next morning (he was leading the songs) and in between songs told the congregation what he had done and asked if anyone found his golden ticket because he had a prize of a diamond ring for the finder. Of course it was a diamond RING POP. No one claimed to have found it to his dissapointment. I bet it was an elderly lady who had no clue what it was and threw it out. He is SUCH a funny guy sometimes! Sunday we celebrated my nephew Max's 3rd birthday. It was great fun at our house. Liz and Eric got pizza for everyone for lunch and we had fun time watching Max open his presents and Jack take pictures. I made a four layered cake - yellow and chocolate with chocolate frosting, allergy free, of course! It was a Wubbzy birthday and Max had a blast! This morning we asked Jack if he had a good night's sleep and his response was, "No, cause I didn't have any dreams." Yesterday Jack got some cool sunglasses in his goody bag from Max's party and he gave the heart shaped pair to Nanny and kept the star shaped pair. Well Nanny left hers at our house so Jack was all concerned and called her at her house (he knows how to dial her phone number by himself) and told her, "Nanny, you forgot your sunglasses at my house. I bring them to you tonight at church." The other night I was putting Jack to bed and he told me he was hungry. I told him he ate plenty for dinner and shouldn't be hungry. Then he told me he had a "little sister" in his belly and he needed food cause she was hungry. I was not sure where that came from, but he probably remembers Auntie Lizzie having baby Addie (Max's little sister) in her belly and thought it worked for her so it should for him! 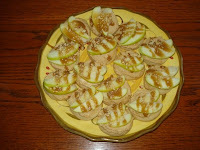 So lastly, I will share a great recipe with you that I made for the Ladies Lunch - Caramel Apple Cookies. My friend Sarah from college made these recently and shared the recipe and they looked so heavenly I couldn't wait to make them. Unfortunately her recipe had peanut butter and nuts included so I made a few adjustments to make them safe for our family. Enjoy! Frost the sugar cookies with the frosting you made (if it is too soft after mixing together you made need to refrigerate until it thicken back up a little), top each cookie with two apple slices, and drizzle with caramel! They were a big hit and tasted wonderful. I didn't get a picture of these finished as I was rushing out the door after I made them, but here is my friend Sarah's picture of hers (she made them with peanut butter mixed into the frosting, and chopped nuts on top). I can't wait to try these cookies! Thanks for sharing the recipe!